Here's the first part of trying to do a less subjective test of the effect of an intervening cover slip on Mitty performance. I say "trying" because I appear to be cursed. When I use a 10x Mitty, or anything with lower magnification, nothing stirs outside my house except perhaps an occasional pedestrian walking by. But the instant I screw in my 50x Mitty, the 4th, 5th and 6th armoured divisions decide to travel down my road, accompanied by every JCB and bulldozer in the county! In short, the 50x test may be suffering from vibration - but it still shows the effect of using a coverslip, so I posted it anyway. 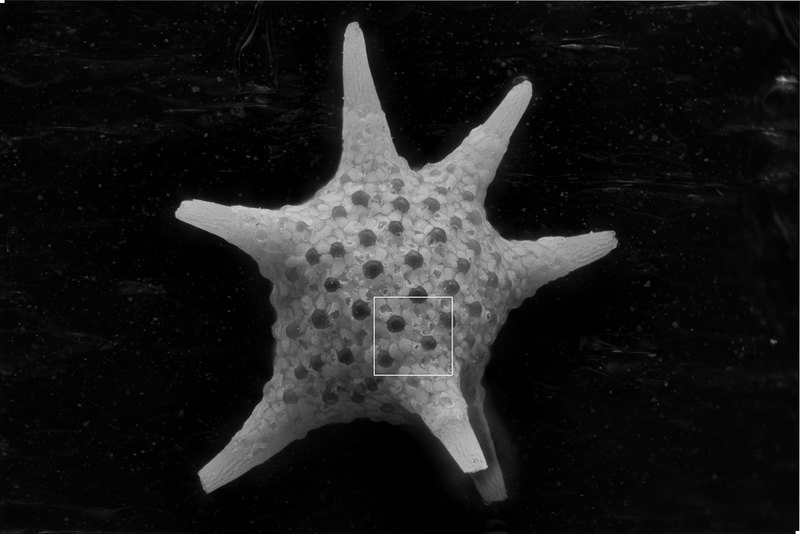 I was only testing for resolution here and wanted to use a "real world" stacked specimen with some depth, so I used a foram from the star sand. 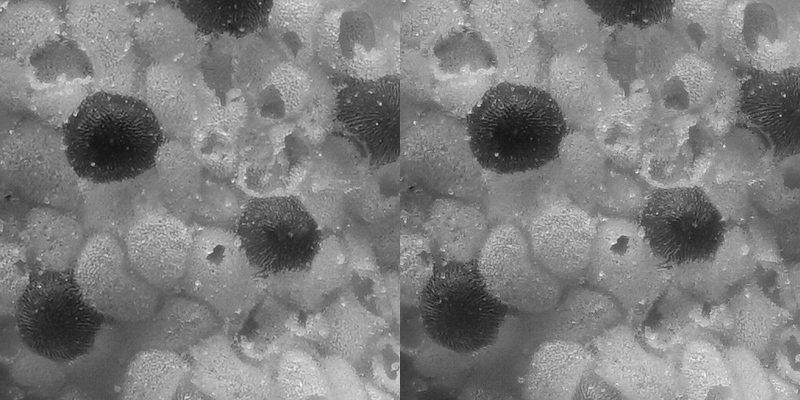 The foram was mounted on a piece of black sticky foam and a 0.145mm thick cover slip was placed 1.5 mm in front of it for the "with cover slip" images. Note: the coverslip was held on a separate mount, so it stayed still (fixed distance from objective) as the subject was moved for focus stacking. Pictures are 200-image stacks. They look a bit dull because I applied no image processing except for straight b&w conversion, levels and cropping where needed. 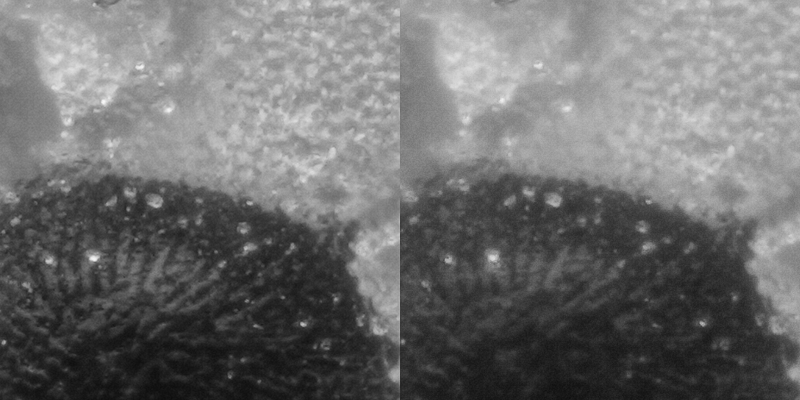 50x mitty 100% crops without (left) and with (right) cover slip. Note, these are vastly oversampled, so both are "soft" anyway, but there's a marked deterioration with the cover slip in place. Conclusion. 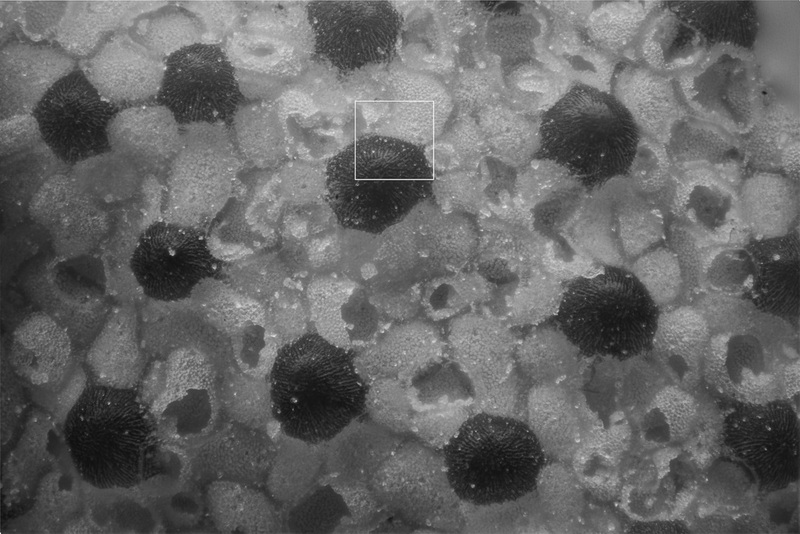 Degradation is really only noticeable in deep crops, moreso at higher NA and magnifications. Overall quality with an intervening cover slip is perfectly good for web-scale images (1k pixels or so on a side). I'll do some more tests involving water (micro-aquaria) tomorrow. 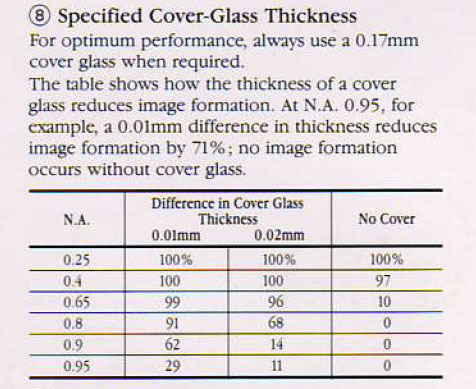 For NA's of most 10X objectives (and even 20X for that matter) coverglass thickness issues -- within reason!-- are pretty minimal. Rik helped me with somewhat related optical calculation before. His calculation says that NA 0.25 0.17 mm ocrrected objective can tolerate 1mm of water (on top of subject of interest) pretty well. My experimental assessment agrees with that. My experiments also told me that NA 0.4 0.17 mm corrected objective does NOT tolerate 1mm water well. But a NA 0.4 1mm corrected objective can tolerate 0.17 mm cover slip pretty well. My experiments were not rigorous though and may be affected by particular equipment combination and personal preference. M type 0mm corrected objective used for 0.17mm cover is probably not a huge mismatch, at NA < 0.3. Should not be as much a mismatch as 0.17 to 1mm, I would think. With respect to the current discussion, the key results are summarized in the paper's "Text-fig.5" and "Text-fig.6" as show below. However, the graph on the left -- "Tolerance to cover-slip thickness" -- is not nearly so well known. In fact feeding that exact phrase to Google search returns, at this moment, exactly one hit, which eventually resolves to the link at onlinelibrary.wiley.com that I gave at the start of this post. Accepting the paper's opinion that "k=8.0 might be a value representing...the limit of excellent photomicrographs", we can see that this is represented by line C, with k=7.82. In contrast, for NA 0.50, Line C shows a tolerance of only about 0.15 mm. (The experimental data point is about 0.20 mm.) Again, somewhat more water could be tolerated. Interpolating at NA 0.40, the line C tolerance would be about 0.3 mm of glass. One thing I find very interesting about this paper is that it is almost completely experimental. The few formulas that do appear are all described as curve fits to the experimental data, not as anything related to optics calculations. This approach is a striking contrast to the seminal paper by H.H. 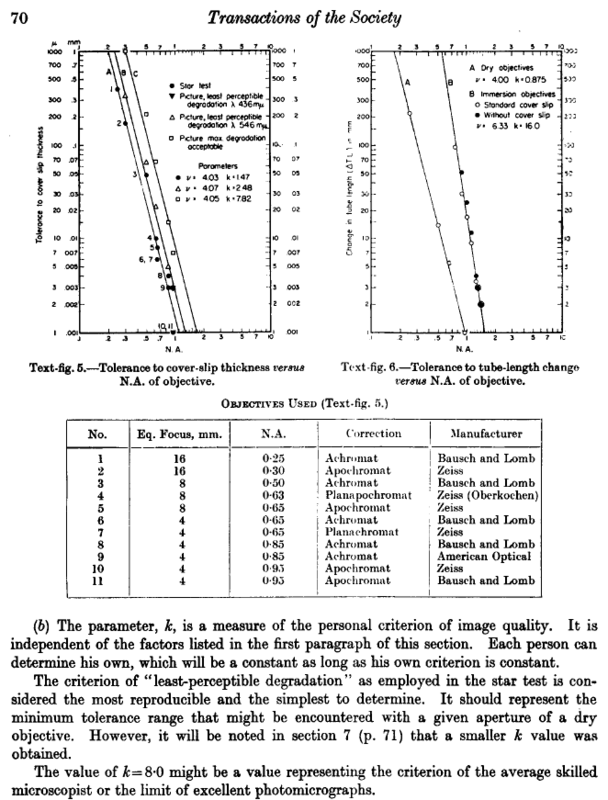 Hopkins, "The frequency response of a defocused optical system", Proceedings of the Royal Society A, v. 231, London (1955), pp 91-103, which dates to 5 years earlier but is almost entirely mathematical, with just a little experimental verification.